Four years ago this month, over a period of 4 weeks, I looked within, searching, listening, waiting for my greatest, deepest - below all else - heart's desire to surface and make itself apparent. I did that so I could ask God, my longtime Father, friend and lover for that desire. Finally one rainy night alone in my car traveling towards home on mostly empty streets I shouted/sobbed in an agony/ecstasy of desire, so forceful that speaking it left me utterly spent. "I want them to know You, God - I want them to experience You in your fullness." The "them" I referred to was my husband and sons and new daughter-in-law. "Them" - though intensely focused on the four already in my family - included the as yet unknown woman who would, hopefully, eventually stand beside our second son as wife, and any children that might come from these unions. Expressions of desire that powerful do not simply vanish. I knew, as surely as I knew my name, that in the utterance of that desire, I had opened a door to a new world for myself and these ones I loved with such passion. A world that would almost certainly involve more hardship and suffering than we had hitherto experienced. A world that called out "Goodness", "Love", and "Truth" from my stance outside the threshold, but once entered, would bear labels like "Loss", "Grief", and "Suffering" and would likely have me screaming for escape or respite for myself and my loved ones. That much I could glimpse with my forward looking eyes through a Biblically grounded mindset where wanting to know God fully seems to require knowing Christ in the fellowship of sharing in his suffering - Philippians 3:10-12. Christianity does not have a monopoly on the "suffering required for fullness of life" theme, but the writings in the Bible do seem to highlight the possibility of a fuller relationship with this Supernatural Other in the midst of or as a result of suffering and pain. The New Testament writings, in particular, imply that increased pain and loss will come to those who choose to become Jesus' friends. What I did not foresee, even in my wildest pre-prayer imaginings, was that, in my 50's I would struggle so mightily with "the existence of God" and "the meaning of life" questions. I did not foresee that I would come to a place where I felt I could trust neither the traditional Christianity played out in the churches I knew or my past interpretations of "hearing God's voice" in my Bible reading and prayer. I did not foresee that within a matter of months I would go from being a woman who rarely started a day without extensive Bible reading, prayer, and journaling to becoming a spiritual deaf/mute, who avoided picking up the Bible and struggled with unbelievable effort to frame and direct my honest questions to a God whose existence I seriously doubted. I did not foresee that my inability to place the newly encountered suffering comfortably within my past theological/world view boxes would bring about a lengthy retreat, not only from regular church attendance and involvement, but also from my extensive community of friends - all of them evangelical Christians. I knew it would be way too threatening for most of them to see that Sandy, "the strong Christian, the prayer warrior", had moved into an agnostic stance - seriously doubting the existence of God. I felt that most of my friends, upon hearing my struggle - assuming I could clearly articulate it - which I couldn't - would do what I would have done for so many years - answer quickly and try to "fix" me. Fix me with scripture passages or stock American Evangelical "box" answers that had become too shallow to impact my thinking. I reasoned that if the God I had known and loved for so many years did exist, then he had heard and was in the process of answering my deep heart desire, and if so, I didn't want to be fixxed. I wanted to find out what I could only find out by walking through the struggle. Even if that meant I came out the other side still broken. I tested the water with one friend I thought had experienced enough suffering and loss to perhaps identify with the "restructuring of belief" in which I found myself immersed. Nope. Listening, really listening to my intellectual struggle was something she was not at all prepared to do. I also figured I might - at some point - move out of depression - if that's where I was - or resolve the questions and move back to a stance of firm belief in traditional Christianity. I had no desire to awaken faith struggles in others and feel responsible for their "loss of faith", so that too, has kept me largely silent and withdrawn. Since then, over these past three years, I have confined trying to speak about my intellectual and faith struggles only to my immediate family and 2 exceptional friends, one in her 20's and one in her 60's, each of whom has cared for me more than I deserved and has listened intently, with her entire being. This morning I came across this quote I had copied into my journal just over 4 years ago, just two months before "the dangerous prayer". It's an apt description of part of my journey. "Moving into another culture is often traumatic. In a brief moment, all that we know can be shattered into little pieces. A different landscape, language, values, and worldview leaves us uncomfortable, if not terrified. In response, we quickly erect barriers in an effort to stop, or at least buffer the onslaught of foreign realities. How difficult it is to summon the courage for breaking through the fear of the unknown. For many people, engaging a new world is an experience of losing the self. When this happens, it is hard to believe that a new self or frame of reference will be found. Anthropologists use terms such as "freezing of boundaries" to describe defense mechanisms employed for battling the perceived enemy - the unknown. In cross-cultural experiences, the typical stages of fear, denial, anger, and avoidance have been well documented. Some people are able to move through and beyond these stages, while others hang on to the familiar with persistence and passion." So now I find myself in a vastly different place from where I sat 4 years ago. It is not the place of angry existentialism or despairing agnosticism of 2 years ago. But it is still a place of questioning and waiting, still a place of reading, writing and thinking; still a place of listening more than talking, still a place of laboriously reconstructing, bit by bit, my foundation of belief. It is still a place of a different kind of prayer. 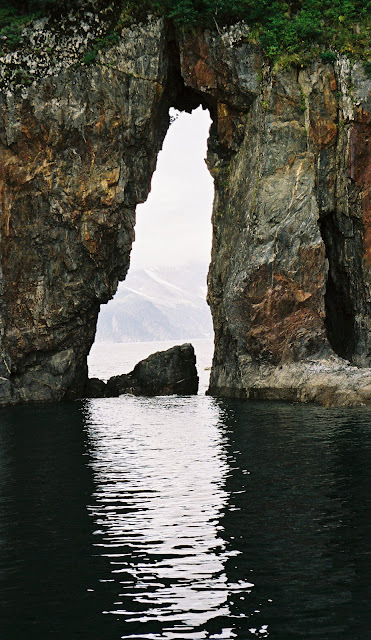 The photo above was taken on Resurrection Bay, south of the Kenai peninsula, Alaska. Wow. Alright - now transfer some of that rootlessness and despair into a seminary context and you've got me in 2005, sobbing on my steering wheel in front of Beeson saying, "I don't believe in You." Three years later and I really don't know why it's past. Maybe it was a couple classes I had that actually inspired me and engaged my faculties. Maybe it was the healing Presence and voice I found reading the borrowed words of the Daily Office. Who knows how to classify the secret work of the Holy Spirit imparting hope. Watchman Nee said that eventually God hides from the believer so that they must learn to trust even when they are in darkness and cannot see. That made me panic, and I really haven't liked Nee as a person since I read that in India in 1999. My prayer used to be "God strike me dead if You know I'll serve you at anything less than full-on zeal." I'm thankful that He didn't, because I wouldn't be here now with an opportunity to return to my first love. Now I'm willing to be pretty unimpressive as long as I don't hurt people. Please Jesus, let me not harm people! Incidentally, Sandy, you'd be intimidating to spar with if I were an argumentative "miserable comforter." I also read the mood and agenda of what seems to be the standard evangelicalism of our churches - represented in tidy doctrinal lists, and then I come over to the edge of the existential cliff with Kierkegaard: fear and trembling on the one hand, meaninglessness on the other. How do you put that into a doctrinal statement? And how do I as a pastor reconcile these two polarities? The external social concerns and expectations of the people I serve -- and the internal and spiritual/existential and eternal/eschatological realities of Christ and my own salvation? Oh yeah, my new prayer is the same as yours, the same as Moses (show me your glory), the same as David (One thing I ask), the same as Philip (show us the Father), and the same as Paul, "I want to KNOW CHRIST." It's all come back down to that one thing. Hijacking? No way! When I read your comment I felt like you had walked across a turbulent lake or sea to climb in my kayak with me - on the very day I needed it most. Thank you for your transparency. "Three years later and I really don't know why it's past"...I really identify with that, except that I can't say its all the way past yet - I just can feel myself more on one end of the belief spectrum than the other most days - finding myself "in a different place" without knowing what physical/spiritual/mental interchange facilitated it - definitely. Ah yes, Watchman Nee - a dangerous guy for me. If I remember correctly, I didn't venture far enough to finish any one of his books I started - I'd get to a precipice where I felt he was urging me to step off and I'd back away, feeling I might be risking my sanity or essential personhood, if not my physical life. I'd read plenty about the "dark night of the soul" in years past, and have been reading Mother Teres's bio about a lifetime of the dark recently,and these accounts didn't seem to fit my experience. It seemed to me the people I read about were still longing greatly to experience God in ways they had grown accustomed to, and instead, on many days I felt duped, self-deceived and angry - hurling angry rehetorical questions into space, knowing that these questions had never been answered in a way that a person who refuses to look through eyes of faith would find conclusive. And this time, for about two years, this woman who has "influencing others" as one of the foundation blocks of her personality, felt she didn't have anything worthwhile to say. When I pictured many of my past "influencing for truth" thoughts and actions, my mental label on the photo had changed from "passionate, truth-teller" to "naive arrogance in action." I've been wincing alot.